Looking for a personalized art experience for your students? Let us build a unique program with you! We will work with you to customize the group program to fit your goals or curriculum, ensuring a fun, creative, and memorable experience. Find out more about our educational group program offerings for schools, libraries, nonprofits, girl/boy scouts, community centers, and home school groups below. 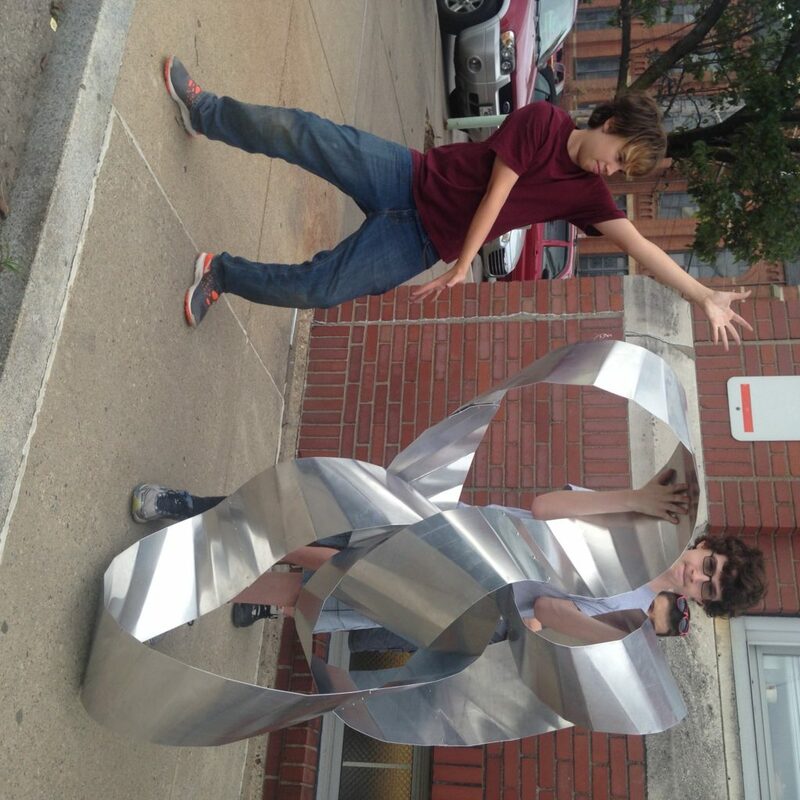 If a visit to Contemporary Craft is prohibitive, contact us about outreach programs that we can bring to you! Want to make the most of your field trip to Pittsburgh? Coordinate a combined visit to both Contemporary Craft and Pittsburgh Center for Creative Reuse. Get double the fun and hands-on learning while you’re in the city. Ask us about this combined experience at thestudio@contemporarycraft.org. Come make something with us in The Studio! 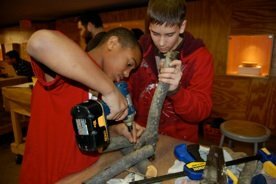 We offer hands-on programming in woodworking, metal, fiber, and clay. With the instruction of professional artists, students will use the tools and equipment in our studios to design and make their own functional objects or works of artistic expression. Read on for examples of our hands-on experiences. All activities can be customized to meet individual needs and/or interests. 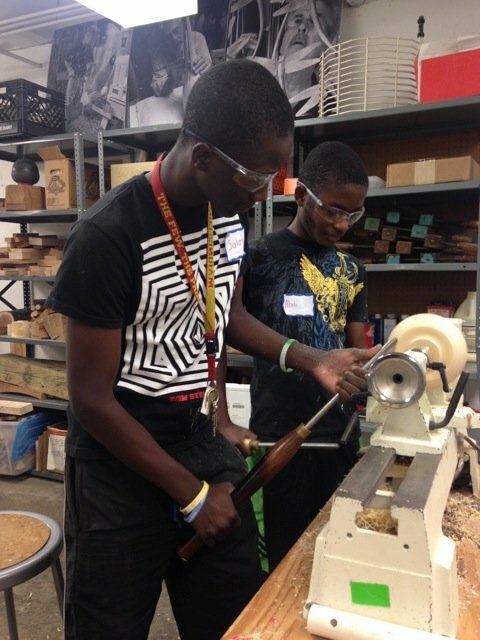 Students will learn the basic operation of a lathe. 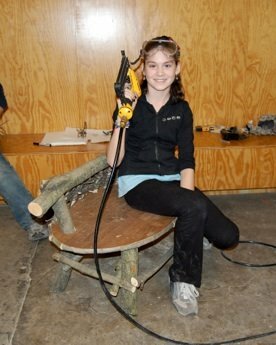 During this session they’ll work with a professional woodworker to be introduced to the basics of working with wood, as well as delve into learning about the variety of wood species. From there the students will each have their chance to work at the lathe, turning their own pen and applying decoration if they’d like. 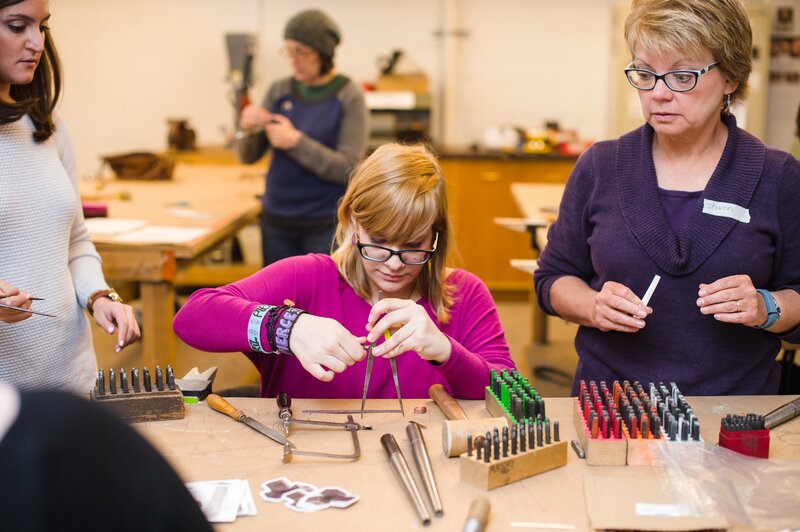 Students will work with a professional metalsmith to explore the basics of working with metal. Make your own personal message on a copper wallet insert, keychain, or pendant. Learn basic metal skills and stamping techniques to make the piece personal! Students will work with a professional metalsmith as they explore the basics of working with copper. From there they’ll be introduced to the process of introducing the glass-like finish of enamel, leaving with their own finished piece. Students will explore different clay bodies and their properties as they construct their own slab-built tableware. From there surface texture and design will be added, followed by underglaze. Each piece will be fired and clear glazed prior to being returned. Prices range from $15 -$30 per person. There are additional options for hands-on experiences in our Studio. For more information, please contact us at thestudio@contemporarycraft.org. Ask how we can incorporate STEAM into the lessons as well! In conjunction with each exhibition, a range of multi-cultural, educational programming is available for students and teachers. Group tours in our gallery encourage seeing, participating in hands-on activities and learning about the innovative use of materials. While we have a few suggestions below, customized experiences are also available. Staff is able to scaffold programs in order to meet the needs of students in grades 6 through college. Walk through selected works featured in our current exhibition with a guided exhibition tour. Learn how to examine formal and conceptual elements in an artwork through Visual Thinking Strategies. In this activity students are encouraged to look closely at the exhibit by searching for the answers to a series of questions. This will help them learn about how artists choose their materials and what they expect their piece to communicate. Have your students listen as an artist statement is read. Students sketch what that statement communicates to them. Afterwards, they can see the work for which the statement was written. Students are given cards with five different artist statements. They must match the artist statement to the piece in the gallery that they think best reflects this statement. As a follow up, students may be asked to develop their own artist statement. Have your students every asked “Why is that piece on display? How was it chosen?” Our program, Be The Jury, helps answer those questions. A Contemporary Craft staff member will walk your students through the criteria that jurors and curators use when selecting pieces for a show. After this, they can “Be The Jury” and vote on which piece in the exhibition they think best meets these criteria. They may surprise you with their vote! Contemporary Craft is helping to Remake Learning in the greater Pittsburgh region. Learn more at remakelearning.org.